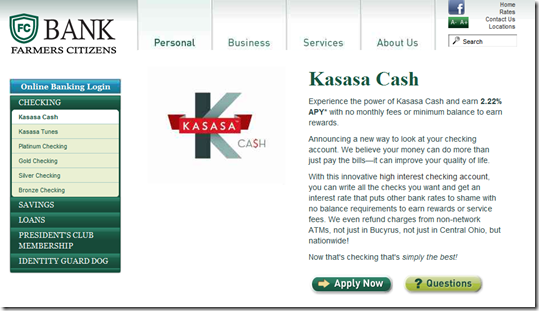 Is BancVue’s Kasasa to Checking What "Intel Inside" was to PCs? I just spent the better part of two days attending BancVue’s monthly client/prospect meeting called BTAN (note 1). I knew they would have high-energy presentations, great ideas, and outrageous antics; after all, I’ve seen them take home three Finovate Best of Show trophies. They know how to drive a point home. One very different element here is that BancVue is creating a national brand exclusively for use by community banks and credit unions. Large banks are viewed as the enemy (see inset from BancVue’s “about us” page) and are not allowed to “stock” the Kasasa brand. On the surface it seems impossible. 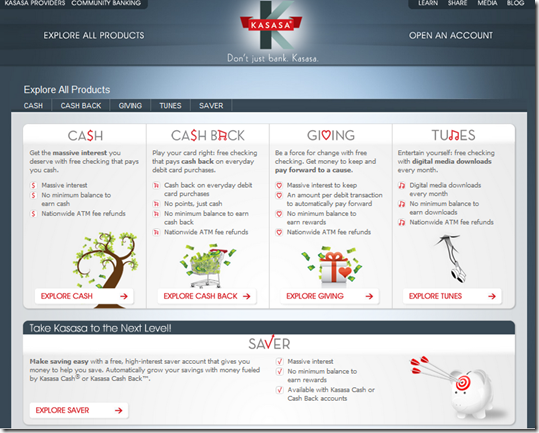 How could hundreds, if not thousands, of proud, local financial institutions — many who’ve been building a local brand for many decades — unite under a nutty brand called “Kasasa” of all things? But is it crazy like the iPod was crazy? Smaller banks and credit unions are being taken to the cleaners by the big banks, losing more than half their market share in the past two decades. They have the local ties, the human connection, but it is usually hard to maintain the product set, marketing power, and online/mobile UI, of Bank of America or Chase. But what if someone was able to level the playing field with best-of-class products and combine the marketing power of 1,000 financial institutions into a national brand? 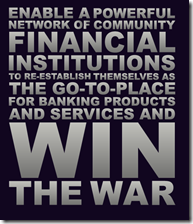 (note 3) Then the community banks/CUs could go ahead and compete on service, price, value and local connections. It sounds too good to be true, really. And I was skeptical when I heard the pitch two years ago. But after seeing how BancVue has signed up more than 600 FIs for rewards checking, hit #23 in the Inc 500, and witnessing their passion in person, I think they have a real shot. Bottom line: It takes a long time to build a national financial brand, especially one centered on lowly checking accounts. Other than PayPal, what’s the last one you can think of? Capital One, founded 1988, maybe. Discover Card, launched in 1985, perhaps (note 4). And I can think of a hundred reasons why it won’t work. But Kasasa is definitely out of the gates and gaining traction. Having just finished my review of the most important trends of 2011, I have a feeling Kasasa could make this list in 2012 or 2013. 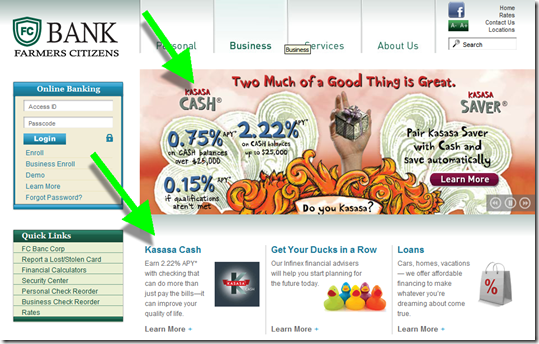 Question: Do Kasasa ads clutter the Farmer’s homepage? No more than any other promotion. And they are at least attention getting. 1. I attended the event at the invitation of BancVue. But I am not consulting for them or their customers. BancVue is a customer of The Finovate Group for our event and our published reports just like hundreds of other companies. However, they did feed me really well, which, as my family will attest, is a powerful motivator in my life. So I can’t say I’m totally unbiased. 2. After hearing the detailed reasoning behind the branding decision, I actually think the Kasasa choice makes sense. But you’ll need to see the presentation to get it. The Financial Brand breaks it down here. 3. BancVue says that with 1,000 financial institutions offering Kasasa it would be bigger than the largest U.S. bank in branch network and marketing budget. 4. I can’t think of any major national banking brands that have appeared in the Internet age other than PayPal, and perhaps NetBank (RIP). ING Direct made it, but they were a spinoff of a powerful international brand, and even then they spent more than a BILLION in the United States alone during the past 12 years making ING Direct a household name. E*Trade, Ally also come to mind, but the former is more associated with brokerage and the latter is a name change from GMAC. Bank of Internet is doing well, but is hardly a household name.